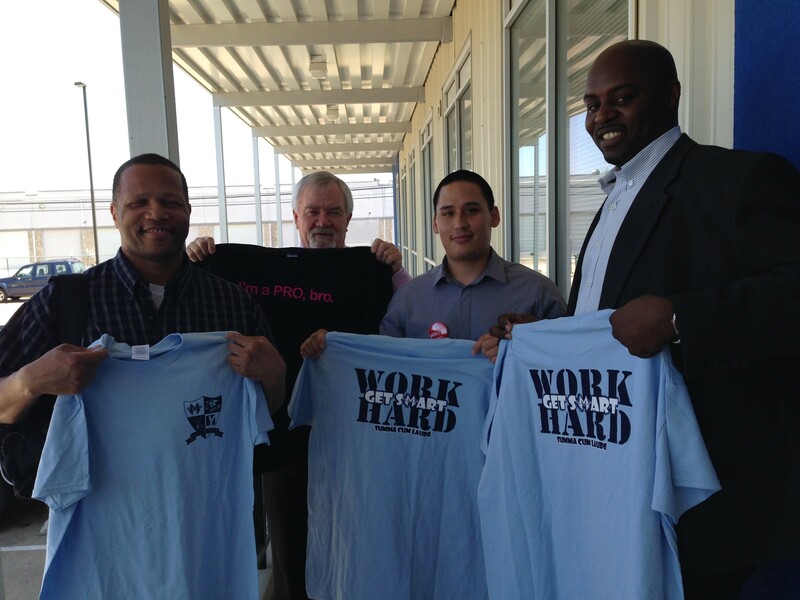 Last week, several PEP graduates were invited to speak to the students of YES Prep in Houston. To the right is a photo of the graduates after the presentation and below are photos of the graduates in action! Since we opened our doors in 1998, YES Prep has continuously redefined possible for students, families and the public education system at large. Our students are currently graduating from college at four times the rate of their peers. Today, with 13 schools in operation, serving 8,000 students throughout Houston, YES Prep is living proof that different outcomes are possible when students from low-income communities are given access to high-quality educational opportunities. Our graduates shared their life stories and offered these young people practical advice on how to release their potential. As we shared in this blog last week, our graduates also recently spoke at the Teach for America Summit in Houston. Many of our graduates have a deep understanding of the issues that Houston’s public school students confront on a daily basis. Some even attended public school in the Houston area, so they truly know what it means to grow up in these communities. More importantly, having been to prison, they have seen what happens when these students succumb to the negative influences around them. Our graduates can frequently share stories of how they were first arrested as children, so their testimonies can make a tremendous impact on these young people. However, this is not a “scared straight” program. We do not seek to change young people’s minds through tragic stories about the negative impact of drugs and crime. They have heard these before: in fact, many of our graduates grew up in families where at least one parent was in jail or in prison. Fear of going to prison did not prevent them from pursuing crime. Rather, we believe that introducing positive male role models into these students’ lives is critical for their long-term success. Nearly half of PEP’s recent graduates grew up without a father in their home. While this does not excuse their crimes, it helps us to understand what contributed to their negative choices. When they enter these schools, our graduates are modeling what it means to be a truly successful man. By sharing how they are able to earn a decent living, take care of their families and even launch their own businesses, our graduates show these students genuine alternatives to lives of crime (which are unfortunately seen in far too positive a light within many of the communities where these children live). This effort also makes a tremendous impact on our graduates’ themselves. As we shared towards the end of last week’s blog, allowing our graduates to assert a new identity as role models helps them to deepen their own commitment to living a transformed life. At PEP, one of our main goals is to inspire our graduates to do more than simply “repay their debt to society.” We encourage them to become lifelong givers, and these men pictured below are tremendous examples of PEP’s driving values of love, servant leadership and wise stewardship. If you would like to bring PEP graduates to speak to your community, please contact us today.